Dr. Otis Brawley has been an outspoken skeptic of routine P.S.A. testing. So what should a man do when his doctor suggests a routine P.S.A. test? The U.S. Preventive Services Task Force, a panel of independent experts that evaluates the latest scientific evidence on preventive tests and treatments, is charged with making recommendations in just such situations. It already recommends against routine screening for men over 75. According to an internal document, in 2009 the task force conducted an in-depth analysis of data and seemed poised to give routine P.S.A. testing a “D” rating — “D” as in don’t do it — for any man of any age. But this was around the time that the task force stated that routine mammography for women ages 40 to 50 was not necessary for every woman. That recommendation caused a public uproar, and Ned Calonge, the task-force chairman at the time, sent the P.S.A. recommendation back for review. One year later, in November 2010, just before midterm elections, the task force was again set to review its recommendation when Calonge canceled the meeting. He says that word leaked out that if the November meeting was held, it could jeopardize the task force’s financing. Kenneth Lin, the researcher who led the review, quit his job in protest, and now, nearly two years after its initial finding, it remains uncertain when the task force will release its rating for P.S.A. screening. Cancer screening is a growing field; existing tests are becoming more sensitive, and new tests are constantly developed. We now have CT scanning for lung cancer, and there is also a blood test marketed by Johnson & Johnson known as a “liquid biopsy,” which searches for stray cancer cells in the bloodstream. More testing inevitably brings more treatment, because the urge to correct every cellular anomaly, no matter how small or potentially harmless, is practically irresistible. But if there is one lesson from the P.S.A. test, it is that more information and intervention do not always lead to less suffering. At one time, Otis Brawley, too, assumed that routine screening was the best medical practice. Sitting in his living room in an Atlanta suburb, Brawley recounted his transformation from believer to skeptic. In 1988, after medical school at the University of Chicago, Brawley landed a prestigious fellowship at the National Cancer Institute in Bethesda, Md. There he came under the tutelage of Barnett Kramer, an oncologist and epidemiologist who went on to become the associate director of the institute’s early detection and community oncology program. Kramer walked Brawley through a short history of screening, beginning with the Pap smear, which has been an unqualified success, significantly cutting cervical-cancer deaths. 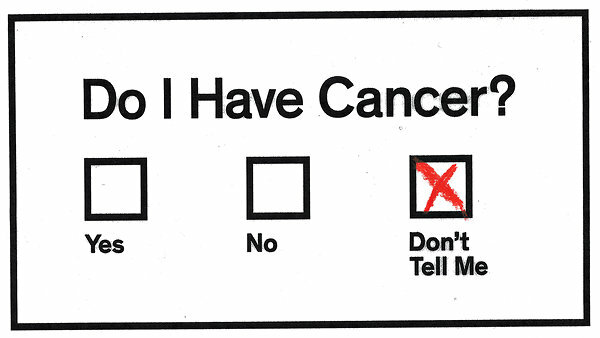 But other cancer screening tests had not worked out so well. For example, researchers at the Mayo Lung Project conducted a study between 1971 and 1983 to determine whether frequent chest X-rays could help reduce deaths from lung cancer. Chest X-rays detected lots of suspicious spots and shadows on the lungs and probably led to some cures of early lung cancers, but the study ultimately found no difference in death rates between the patients who were screened and those who were not. Kramer suggested one probable explanation: diagnosing the spots picked up by X-ray often requires surgery, which carries a small but definite risk. Brawley knew that many spots seen on X-rays are simply old scars or minor abnormalities commonly seen in healthy people. With so many innocent blips detected, complications from lung biopsies and other invasive tests, along with treatment complications, could kill enough patients to negate any benefit from early detection. This entry was posted in American Cancer Society, New York Times, Prostate, Prostate cancer, Prostate cancer screening. Bookmark the permalink. ← BREAST Cancer Blocker! Well Beta Blocker actually! This "cancer" posting Completely useful..good source, thanks anyway!